As the stars ascend over the West Bank, the neon light goes down in the open-air cinema’s projection house. The projector flickers into life and the rotating beam hits the screen. The moment everyone has been waiting for has come: 23 long years since the last screening, films are showing once more in Jenin. 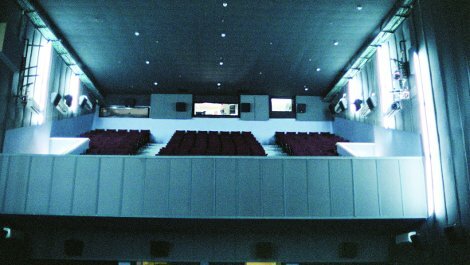 Cinema Jenin’s renaissance was made possible by funds from the Federal Foreign Office and numerous other foreign sponsors. On the ground Palestinian and international volunteers, supported by local experts and business people, worked together for nearly two years on the reconstruction of the only cinema in the north of the West Bank. 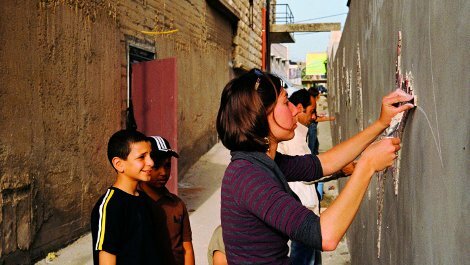 It was not always easy to get this kind of project off the ground in Jenin. There are still many people here who reject any form of “normalization” in the form of cultural and partner projects. The mistrust of the Israeli authorities sits too deep in the local population. However the number of those prepared to make peace on a one-to-one level is growing. This is also thanks to Cinema Jenin and the team of international and Palestinian workers. The history of the cinema is closely connected with the history of the Middle East conflict. 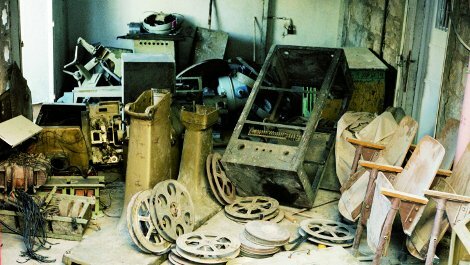 The cinema had to close in 1987 during the first Intifada. In the years that followed, the building, with its broadly international style, fell more and more into disrepair. In 2008 the German film-maker Marcus Vetter came to Jenin to tell the story of Palestinian Ismael Khatib. Khatib’s son was shot by the Israeli army in the former refugee camp of Jenin. His father decided to offer up his organs for donation – including to Israeli children. The case attracted a great deal of international attention. 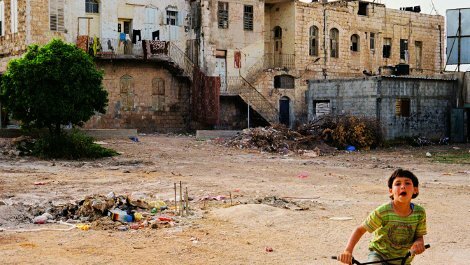 In April 2010 Vetter’s documentary “The Heart of Jenin” won the German Film Award 2010. During filming Khatib drew the director’s attention to the empty building. An idea was soon hatched to make the town’s cinema accessible to the public once again. When the Federal Foreign Office heard about the project, it provided start-up funds, which were later considerably increased. Soon supporters for the project appeared from all over the world. A cooperative project was born which is based on dialogue and the idea that participants organize themselves. The project involves local people at grassroots level and facilitates follow-on projects. As such it could serve as a model for sustainable development in the Middle East. In around two years amazing things have been achieved. The stage has been restored and a total of 400 seats refurbished in the stalls and upstairs gallery. New sound and lighting equipment makes for a professional sound. A German cinema chain donated projectors, and soon even 3-D films will be shown. A summer garden with projection house sprung up from nothing. Palestinian Prime Minister Fayyad came to the opening on 5 August 2010. Young Palestinians and international guests crowded together in front of the red carpet. 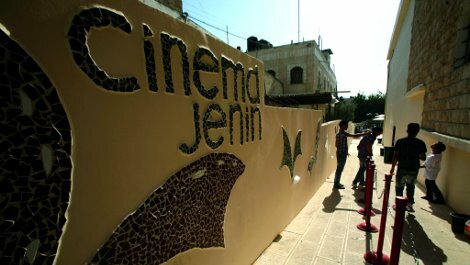 At the last minute the “Cinema Jenin” sign was fixed above the entrance. The town was in a state of frenzied excitement. On the opening evening, as one looked at the faces of the people sitting together in the open-air cinema watching “The Heart of Jenin”, one could not but believe in the power of cinema to bring peace. The cinema theatre is a magical space of dreams and illusions – and there is a grateful audience in Jenin ready to enjoy it. 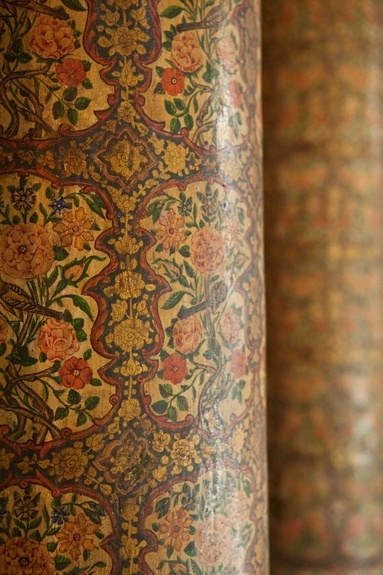 Situated in the heart of the Afghan government quarter in Kabul, Kuti e Baghtsha, the “house of the little garden”, contains exquisite examples of Afghan art. 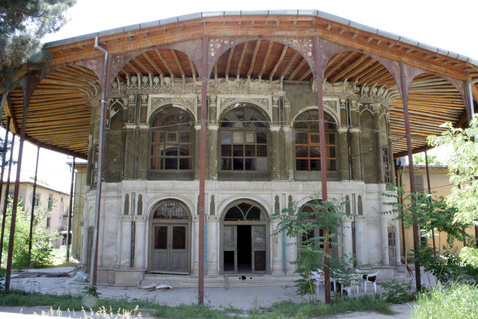 Abandoned for many years, the Pavilion is now used by the Afghan President when receiving guests. The Afghan Emir Abdur Rahman Khan – the Iron Emir – had his seat of government built in the centre of Kabul in the form of a fortified citadel (Arg). As the “nucleus” of the Afghan nation, the Arg was of historical importance. In the last century, the palace complex was the seat of several generations of rulers who wrote Afghan history. Kings were crowned and rulers assassinated here. In the southern corner, a small pavilion was built with rich decorations consisting of lavish wall paintings, stucco, carvings and gold leaf embellishments of the highest artistic standard. An oriental garden was created around the pavilion. Known as Kuti e Baghtsha, the “house of the little garden”, the elaborately decorated pavilion was constructed between 1880 and 1901 to plans by Emir Abdur Rahman Khan. From 1924 to 1931, the Emir’s Pavilion Kuti e Baghtsha housed part of the Afghan national museum. Kuti e Baghtsha before the restoration. After the invasion of Soviet troops in 1979, the Arg complex was damaged and fell increasingly into disrepair. The restoration work undertaken in 1990/91 was destroyed in the prolonged civil war that followed. After the end of the Taliban regime in 2001, work on the Arg complex began with a view to using it again. However, Kuti e Baghtsha was not included in this project until 2008 and became increasingly dilapidated. Due to its uniqueness, the Afghanistan Rehabilitation Group, a German society established for this purpose, carried out restoration work from 2008 to 2012 with the support of the Federal Foreign Office and the Gerda Henkel Foundation as well as with the expert assistance of the Department of Restoration at the TU München under the direction of Prof. Emmerling. Parallel to the restoration work, a training programme was set up to enable young Afghan men and women to take part in a two-year further training course to qualify as conservators specialising in artisan skills. The Afghan Rehabilitation Group is keen to provide women with vocational training and employment. Due to the very different kinds of damage, the restoration required expertise from diverse disciplines. In addition to traditional building techniques using clay, the conservators had to relearn traditional painting techniques. The original plaster was not replaced but fortified. Irreparable stucco was re-formed. Damaged wall paintings were also repaired, while gaps were laboriously filled. Today Kuti e Baghtsha is used for receptions hosted by the Afghan President. The project which is carried out in collaboration with the IANES-Institute, University of Tübingen, the Römisch-Germanisches Zentralmuseum in Mainz (RGZM) and the Egyptian Museum in Cairo centers on approx. 100 gold sheet appliqués from the tomb of Tutankhamun. The main aim is a comprehensive restoration and scientific analysis of this previously little considered corpus of objects. Nearly a century ago now, in 1922, Howard Carter discovered the tomb of Tutankhamen, dating from the 14th century before the Common Era. What ancient Egyptian object is as iconic as the young pharaoh‘s golden death mask? The mask was put on display and caused a sensation. But some other artefacts discovered at the same time have received comparatively little attention. Some of these undeservedly neglected items are now being studied in a collaborative project involving the DAI ‘s Cairo Department – specifically approx. 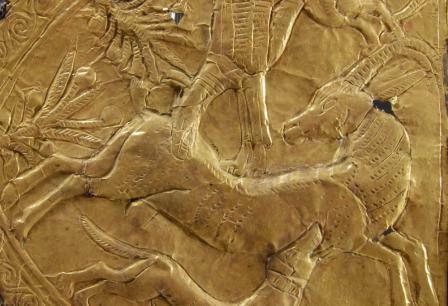 100 fragments of gold relief panels found near the chariots in the antechamber of the pharaoh‘s tomb. They consist of embossed gold foil attached to solid material, presumably leather and textile. Until recently they were kept in the storage magazine of the Egyptian Museum in Cairo. Now these extremely delicate artefacts are being analysed, scientifically appraised, restored and prepared for public presentation. Here and there the solid material to which the thin gold foil was attached still survives. It is thought to consist of several layers of leather, textile and plaster. Non-destructive technologies are being used to determine the composition of the material and the means by which the gold was fastened to it. 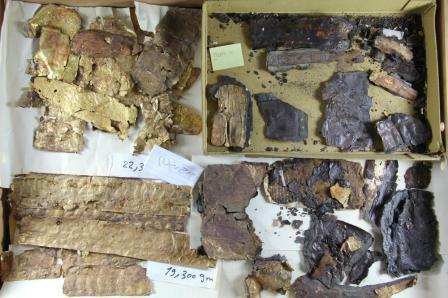 Many of the gold foil fragments have become separated from the material that formerly supported them, and most of them are damaged, displaying warps, folds and tears. But material analysis is only one part of the job. “We want to try and eliminate the damage as far as possible to recapture the legibility of the figural scenes,” says Christian Eckmann, restorer at the Romano-Germanic Central Museum in Mainz. To do this, the restorers have to carefully unfold bent fragments and stabilize cracked ones by fixing them to fine synthetic fibre. “It‘s often little things that reveal a lot,” says Stephan Seidlmayer, director of the Cairo Department of the DAI. For instance, some motifs are traditional in ancient Egyptian art, such as the pharaoh on a hunt, in battle or enacting a rite. Other images occur across the eastern Mediterranean from the late Bronze Age onwards, e.g. bullfights, caprids at a tree, and various ornamental plants. “These gold relief panels, overlooked until now, in fact provide important evidence on international contacts between powers in the East in this period,” Seidlmayer says. These contacts include not only war, tribute and dynastic marriages, but also trade in metals, glass, semi-precious stones, raw materials, luxury goods and foodstuffs, as well as the exchange of officials. And these small gold fragments may also yield new insights into Egyptian chariots of the Bronze Age. 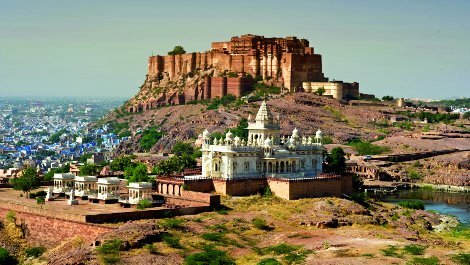 Mehrangarh Fort stands majestically high above the Indian city of Jodhpur. 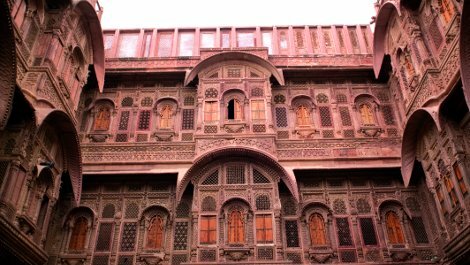 Its scale, the filigree details and its unique situation make the fort a cultural gem on the subcontinent and a valuable heritage for future generations. The fort was founded by Rao Jodha of the Rathore dynasty in 1459 and in terms of both its dimensions and its construction is an outstanding example of Rajput architecture, which was perfectly oriented to the climatic conditions in this desert region: horizontally and vertically staggered rooms, open and closed areas ensure optimum ventilation of the buildings, made of local red sandstone. The exterior is characterized by filigree sandstone jali screens, which let light and air flood in. Mehrangarh fort, in the foreground Jaswant thada, the mausoleum of the rathore royal family. The existing palaces and temples were largely built between the mid-17th and mid-18th centuries, with the Zenana, or Queens’ Palace, forming the heart of the ensemble, both in historical and in spatial terms. Since then the fort, built of red sandstone and set high on a rocky plateau, has been continually extended and altered. Up until about 1890, the fort served as the residence and seat of government of the rulers of Jodhpur-Marwar. Not until the 1940s were parts of it again inhabited; the ladies of the court still resident there finally left the Zenana in the 1960s. 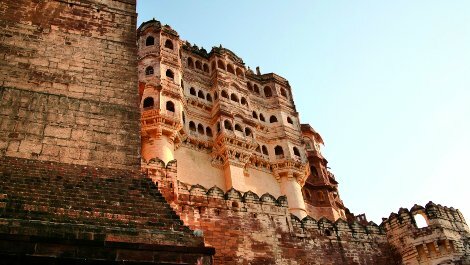 Mehrangarh Fort has been a museum since 1974 and has become a prime attraction offering outstanding exhibitions. View of the central courtyard of the Queens’ Palace. The fort’s sandstone facades in particular are at risk from material fatigue owing to the severe climatic conditions. Decades of inadequate maintenance work have led to serious damage to the facades and interiors of the Zenana. The project of preserving the Zenana began in 1997 with initial preparatory measures including an architectural survey, the listing of recommended conservation measures for each room and urgent repairs to make the ceilings and roofs safe. Conservation and restoration work was carried out between 2006 and 2008. 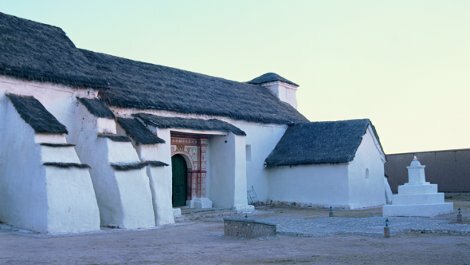 All work was carried out by the indogerman team following the principle of minimal intervention but with the goal of preserving the historic structures, materials and surfaces in as authentic a manner as possible in order to retain for future generations the splendour of the fort in its original state. About 3000 years ago in the province of Tigray in what is today Ethiopia, an entity named Di’amat emerged which was the result of immigration by population groups from Saba in modern-day Yemen. In the early 1st millennium BC, these groups together with the indigenous population established a network of settlements dotted along the trade routes. The Sabaeans brought a range of cultural techniques and expertise – their language and writing system, practical knowledge in agriculture, architecture, arts and crafts, as well as their religious, political and social institutions. Yeha was the administrative and religious centre of this society. If one approached the settlement from the trade routes, the ancient palace and at least two religious buildings would have been visible from a long way off. One of the temples preserved to a height of 14 metres was built around the middle of the 7th century BC and dedicated to the main god of the Sabaeans, Almaqah. In the 6th century of the Christian era the building was converted into a church and is today still a sacred place. Iris Gerlach, Director of the Sana’a Branch of the DAI’s Orient Department, and her colleagues have been working together with the Ethiopian Antiquities Authority since 2009 on a project to preserve the substance of this unique building. First of all they produced exact and detailed structural documentation and a damage assessment map. In the process traditional methods were supplemented by the most modern technologies including 3D laser scanning. The structural documentation served as the basis for the thorough restoration that followed as the next step. Restoration was essential as the structure was at acute risk of collapsing. 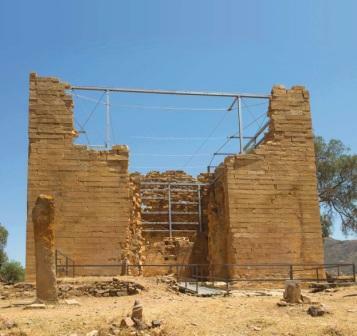 The Great Temple was already in a partly ruinous state when the famed German Aksum Expedition visited Yeha in 1906. A disastrous fire had badly damaged the temple probably in the middle of the 1st millennium BC. The fire completely destroyed the entrance porch, originally supported - by six pillars, as well as the temple’s upper storey and its inner wall shell. This was the part of the building that needed urgent restoration and the installation of a steel supporting structure. 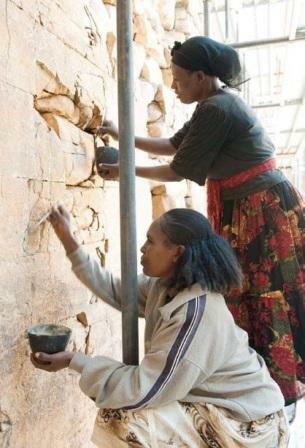 In cooperation with the Ethiopian Antiquities Authority and the DAI 's own advisory committee on historical monuments, the DAI sought to identify solutions through discussion, so as firstly to provide static stability of the frail temple walls and secondly to ensure the restoration measures were acceptable from both a conservation and an aesthetic point of view. 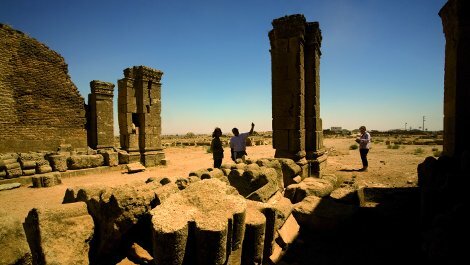 A workshop was organized in Adua, to which specialists from the Ethiopian Antiquities Authority and the Ministry of Culture, architects and statics experts from various Ethiopian universities were invited, who discussed different possibilities of stabilizing the Great Temple with construction history specialists and monument conservators. It was important to involve the priesthood and the local population in Yeha. As the building is still considered a sacred place, every step in the restoration process had to be explained and permission for it had to be sought. All the institutions and individuals involved in the process were finally able to agree on a reversible plan that complied with good conservation practice and was also acceptable in aesthetic terms. The plan envisaged the installation of a high-grade steel structure to support the interior walls upwards of a height of six metres, allowing the Great Temple to be continuously used in the future by worshippers, pilgrims and tourists. Since it is a principle of the DAI to work in a sustainable manner, the project included training for local craftspeople. 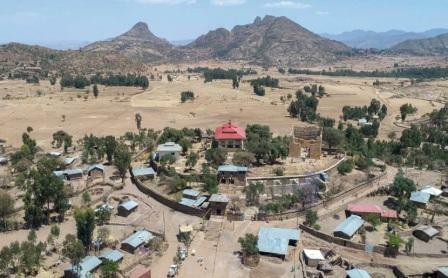 Archaeological and historical research into the region around the religious centre of Yeha has been ongoing since 2009, and since 2016 as part of a twelve-year Ethiopian-German project funded by the German Research Foundation (DFG). 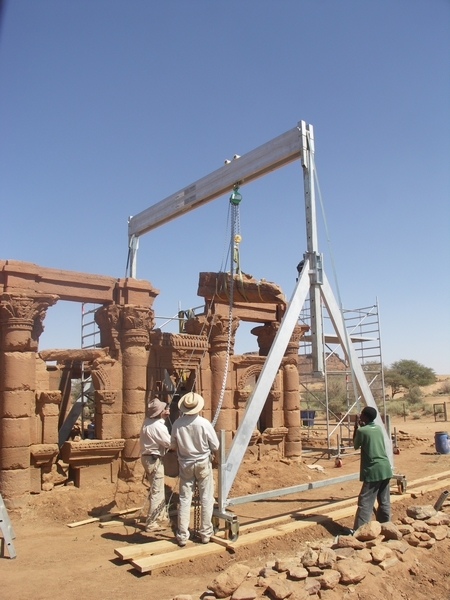 The project is being carried out jointly by the DAI and Friedrich-Schiller-Universität Jena and augments the DAI ’s research into cultural contacts that existed between southern Arabia and eastern Africa. Master's Degree in Heritage Conservation and many others. The Islamic Umayyad dynasty constructed impressive buildings in the Middle East which remain a source of fascination to this day. Indeed some of them still pose puzzles. The most mysterious are the desert palaces built in the countries of the Levant. Almost a dozen such complexes were built in remote places, and academics still cannot agree on their function. Mshatta Palace (in arabic Qasr al-Mshatta), situated south of Amman in Jordan, is one such palace and, in artistic and archaeological terms, the most valuable. The main facade and the audience court were decorated with intricate stone carvings. The detailed foliage scroll work on the facade illustrated the gradual emergence of an independent islamic style of ornamentation. In 1903, as a result of work on the construction of the Baghdad railway, a section of the palace’s facade was brought to Berlin to the Pergamon museum, which was just being established. There the wonderful facade is today one of the jewels in the collection of the museum of islamic art. But what became of the original site? It was forgotten, and not “rediscovered” until the 1960s. Today, lying to the north of Amman airport, it has been rehabilitated and is to be promoted as a further highlight of Jordan’s burgeoning tourist industry. However, a great deal of work remains to be done. The brick walls have been hollowed out by the effects of the weather and need to be repaired using a special mortar made of lime, brick dust and ash. Missing bricks in the style of the old ones will be manufactured specially. Finding the right firms for this requires a good local knowledge, and the formulae and technology require specialist know-how in the field of conservation. 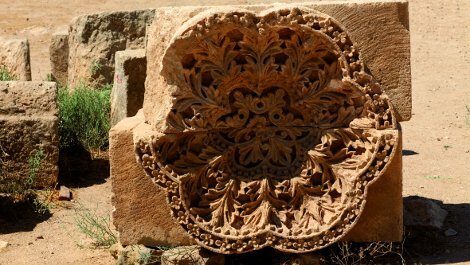 So the preservation and restoration of this unique monument in Jordanian history is an ideal opportunity for a joint project by Jordan’s antiquities authorities and Technische Universität Berlin and the National Museums in Berlin. As soon as the walls have been made safe, the arches, which collapsed as a result of earthquakes, will be rebuilt so that visitors can gain an impression of the palace’s former splendour. Finally, a viable solution needs to be found for the gap left by the facade now in Germany. Then, at the beginning of the 21st century, this authentically restored palace will be another highlight on the Jordanian tourist trail. 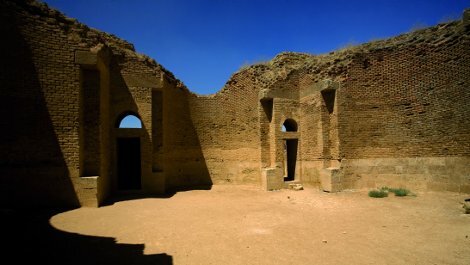 In 744 the luxurious palace complex became the ruin of Caliph al-Walid II, whose ambitious construction projects so angered his people that he was assassinated. The columns of the palace facade were heavily damaged in the earthquake. Loose arch stones are a big temptation for art thieves. The intricately carved rosettes on the palace facade illustrate the emergence of an independent islamic style of ornamentation. The historic village centre of Tran Dang in north-east Viet Nam is testament to a rich cultural heritage. Here, where for centuries people have met, traders bartered and believers worshipped protective spirits, restoration workers are endeavouring to preserve historic evidence. The ancient village centre of Tran Dang – the village hall, the socalled Dinh, being the oldest building – dates back to the 13th century. It stands on a peninsula shaped like a tortoise – one of the four animals held as sacred by the Vietnamese. The joists and beams of the building are decorated with valuable – because of the degree of craftsmanship – woodcarvings. Some are in colour, some purely ornamental, while others depict scenes from folklore and mythology. On the roof ridge there are figures of sacred animals made of rare black clay. The Dinh was later extended to include an altar room to honour the village’s protective deity. The bell tower, village fountain, the bridge to the Dinh and the main gate to the square date back to the later Nguyen Dynasty (1802–1945). It was during this period that the most recent innovations of historical and artistic value took place. During the Vietnam War, the tower bells warned the surrounding villagers of American bombing raids and the village hall was used to store rice and other food. 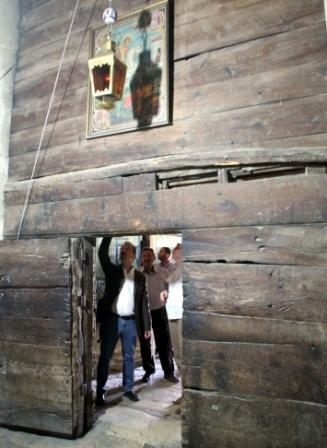 After the war, makeshift repairs restored the damaged building for use as the focus of the village community once more. Over the centuries the inhabitants of Tran Dang have done their best to look after and maintain the building. Over time, however, infestations, water damage and the effects of age have taken their toll on the building. The task of maintaining it was too great for the local population, who lacked both funding and the necessary expertise. Now, with funding from the Federal Foreign Office’s Cultural Preservation Programme, the entire construction of the Dinh – built of ironwood – has been restored in line with its value as a historic monument. The roofs of the main house and altar room extension and other historic features have also been restored. The buildings adjacent to the village hall and the village fountain, also situated in the centre, will be restored next. The village inhabitants are closely involved in the work. That the historic centre of Tran Dang can already bask in its newfound glory is the impressive result of the restoration work so far. The Dinh’s back wall and entrance before restoration. Dragon guarding the bridge to the Dinh or village hall. The village hall after restoration of the facade. Clothes make the man, but very seldom they can survive the millennia. Due to the extremely dry climate of western China, intact trousers, skirts and caftans as well as boots and leather coats are frequently brought to light during archaeological excavations. With this project, a joint research group of five German project partners in cooperation with the Chinese Academy of Cultural Heritage and the Xinjiang Uygur Autonomous Region Bureau of Cultural Heritage (PR China) aims at reconstructing the knowledge about ancient techniques and body, social structures, availability of resources and trade networks in Eastern Central Asia approximately from 1200 BC to 300 AD. Methods from various disciplines will be utilized to reach this goal, including archaeology, textile- and leather research, dyestuff analysis, ornament studies, cut analysis, paleopathology, vegetation and climate research, cultural anthropology as well as linguistics. The oldest discoveries of clothing originate from the less well known indigenous people from the Turfan and Hami regions. As to the clothes dating from the 7th to 3rd centuries BC, these might be identified as remnants of local people as well as of immigrated groups of mobile pastoralists. 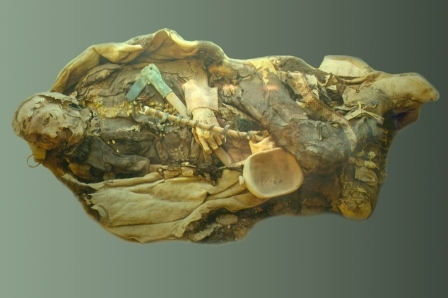 Traces of the nomadic Xiongnu are to be expected among the finds from the 3rd to the 1st century BC. With regard to the most recent finds from the 1st century BC to the 3rd century AD, influences exerted by immigrants and travellers from China, the Greco-Roman Empire, Parthia, Sogdiana, and the Saka city states of the Kushan Empire at the southern edge of the Tarim Basin can be identified. 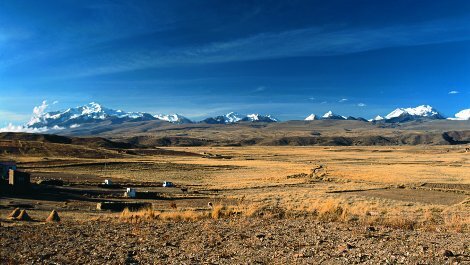 Material analyses and the documentation of the archaeological finds contribute to the development of sustainable practices for the physical conservation of cultural heritage in Xinjiang and their virtual availability worldwide. The training of Chinese conservators and the production of related teaching material are of especially high value in the project. The times the different sites of which the study material was selected from were occupied vary in length and can be divided into several phases from the end of the 2nd millennium BC to the early 1st century AD. 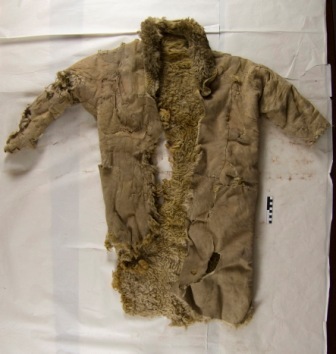 Textile finds from Xinjiang have been investigated internationally especially in terms of material and manufacturing techniques. Unprecedented primary data are gained from the investigation of the apparel of individuals, their climatic environment and texts written in local languages both in quality and quantity, and they will add to the history of knowledge in central and eastern Central Asia. Some of the innovations which we uncovered (e.g. the invention of trousers) are of global importance and are up-to-date still today. They emphasize how important it is to analyze archaeological data on a global scale and to make them accessible to scientists for further research and the broader audience. For our Chinese partners, the practical goal aspired from the research lies in the development of sustainable practices for the physical conservation of cultural heritage in Xinjiang. 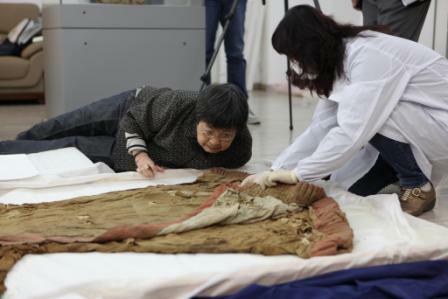 In cooperation with German specialists, the Chinese Academy of Cultural Heritage organizes the training of conservators in safeguarding the find material from China (compare the project “Conservation and restoration of archaeological leather”). Leibnitz Institute for Zoo and Wildlife Research in the Forschungsverbund Berlin e.V. The church of Curahuara de Carangas represents a unique combination of South America’s ancient heritage and Spanish influences. In the pre-Hispanic period, at the spot where today people kneel in prayer, the Inca chief Túpac Inca Yupanqui plunged his golden spear into the ground following a battle. In Quechua, the language of the Incas, “golden spear” is “kori wara”, which was rendered into Spanish as “Curahuara”. So the church bears witness to its heritage in its very name. The exterior of the church of Curahuara de Carangas is modest, built low of clay bricks and topped by a roof thatched with straw. 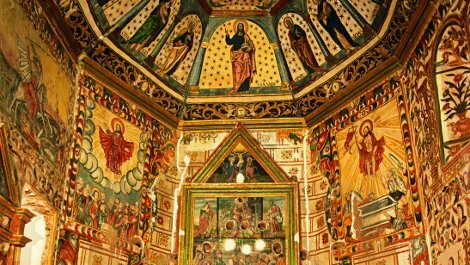 The surprise to be found in the interior is one of the earliest and most complete cycles of frescoes in Bolivia, which has earned the church the epithet “the Sistine chapel of the Altiplano”. The pulpit dates from the time of construction, as do two stone altars, the ceiling frescoes and most of the paintings in the chancel. 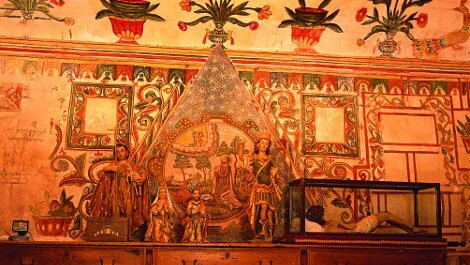 The sacristy, perhaps one of the most beautiful rooms in Bolivia, is intended to depict paradise, with flowers, birds and angels. Like other churches in Bolivia, Curahuara de Carangas was built by local craftsmen and artists. These churches are interesting not only because they give an insight into indigenous craftsmanship and art, but also because they show how the people’s theology took up ideas from the old indigenous religions. For example, gardens of paradise are painted on the walls, because the indigenous population believed that paradise was to be found in the green, flowerfilled lowlands with their fruit trees and twittering birds, not somewhere up in the clouds. Whole series of angels are depicted; angels were used to symbolize ancient gods or to represent the functions and powers attributed to them. For instance, Saint James, known in Spanish as Santiago, also fulfils the function of Illapa, god of thunder. For when the Spanish attacked with Saint James’s protection at the decisive battle against the Incas at Cuzco, there was such a violent storm of thunder and lightning that the Incans believed that Illapa had crept into Saint James’s body – to fight on the side of the Spaniards. The restoration of the roof and the exterior walls financed by the Federal Foreign Office was necessary because they were badly dilapidated and unsound, thus endangering the unique frescoes. A modern lighting system which will not damage the valuable frescoes was installed in the interior, invisible to visitors, and exterior lighting was installed. Work on the main altar revealed a hidden fresco which will be accessible to visitors once it has been restored. As if time had stood still: the church portal looks just as it did 400 years ago. Andean altiplano near Curahuara de Carangas. Close-up view of the sacristy: the glass case on the right contains a reclining figure of Christ carried on display during easter processions. Babur Gardens, known as Bagh-e Babur, in the Afghan capital Kabul are an oasis of peace in a wartorn land. With over a million visitors since they reopened in 2008, the gardens are the city’s most popular leisure attraction and at the same time an important witness of Afghan history. South-west of Kabul Old Town, at the foot of Kuh-e Sher Darwaza hill, lies Bagh-e Babur, one of the oldest surviving gardens from the Mughal period. Bagh-e Babur, laid out after the conquest of Kabul (1504), was one of many gardens established by Zahir ad-Din Muhammad Babur (1483–1530), the founder of the Mughal dynasty. The ruler’s passion for gardens had a long tradition: for thousands of years gardens had been an integral part of home and palace culture. In the Islamic world, garden planning and design incorporates both religious concepts and aesthetic principles. Intricate geometric forms on either side of a central axis reflect order in diversity, transposed in nature with marble water-channels, fountains and cascades. The garden is a metaphor for divine order and, as a paradise on earth, a place of refuge for the faithful. The garden’s importance – and its survival to the present day – is due to Babur’s wish to be buried there, in his homeland, far from the hot Indian plains. As his last resting-place, Bagh-e Babur became a place of pilgrimage for his successors. Their memoirs contain detailed descriptions of the work they financed to embellish the gravesite. After the collapse of the Mughal empire, from about 1750, the garden fell into neglect. Lithographs, early photos and travel writings from the 19th century show it to be unkempt. It was not tended again until Amir Abdur Rahman Khan, the first ruler of a united Afghanistan (r. 1880–1901) and a keen builder, took the garden in hand and radically altered it in keeping with the style of the day. The last major changes date from the reign of Nadir Shah (1929–1933), who put a European stamp on the gardens. It was this garden which withstood the time of war and political confusion, with its sparse vegetation and pockmarked by the detritus of war. Initial plans to redesign Bagh-e Babur paying heed to its historical roots were made back in the 1970s, but the political situation was such that they could not be implemented. It was not until 2002 that a new chapter in the long life of the garden began. Following the discovery of structures from the Mughal era during the investigations carried out by the German Archaeological Institute (2002–2005) the interdisciplinary rehabilitation project of the Aga Khan Trust for Culture modelled the reconstruction of the garden on this research. Responsibility for the garden passed into Afghan hands in 2008, and it has since been managed by an independent trust. In view of its historical importance, Bagh-e Babur became part of UNESCO’s Tentative List for inclusion in the World Heritage List in 2009. Mughul-era water channels in the Garden’s central axis. In the far east of Serbia can be found a very special example of ancient Roman culture: a splendid, breathtakingly beautiful palace built under Emperor Galerius Valerius Maximianus within an imposing and architecturally unique fortress. Emperor Galerius Valerius Maximianus (ruled 293-311) was born in the middle of the 3rd century in the valley of the river Crna Reka, not far from the modern Serbian city of Zaječar, and it was in this valley, protected on all sides, that he erected his residence at the end of the 3rd and beginning of the 4th century, calling it Romuliana after his mother, Romula. Western gate to the old fortified palace. The complex is a special type of monument to Roman court architecture. The palace was built on the instruction of the Emperor as his retirement home and is at the same time the place in which he was buried and deified. The visible parts of the complex were mentioned by travel writers back in the 19th century. The archaeological excavations which began in 1953 revealed the remains of the older and newer fortified palaces as well as numerous buildings serving public and private purposes. The two palaces and the other buildings dating from that time were built in a relatively short period of 14 years (from 297 to 311). The single roadway which once linked the east gate (which has been restored and preserved under the Cultural Preservation Programme) with the west gate divides the complex into a north and a south section, each of which was used for different purposes. The northern half was the site of the imperial palace with a small temple and a sacrificial shrine in the courtyard; the southern half held public buildings (a large temple with two crypts and rect angular foundations and thermal baths) and the palace’s ancillary buildings. 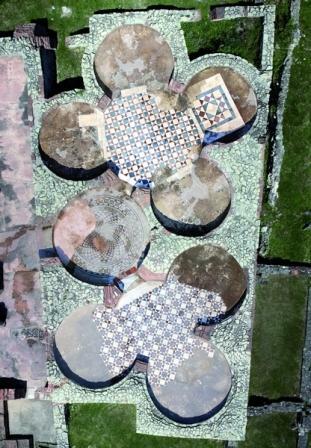 An aerial view of the beautiful floor decoration. The palace is decorated with wonderful mosaic floors with abstract motifs and figures. The most important of the numerous fragments of sculpture found during the excavations is the head of Emperor Galerius from a monumental porphyry sculpture. In the light of its architectural value, but also because of the beauty and quality of the artworks, especially the mosaics, and as it is still a working archaeological site, Romuliana was included in the UNESCO World Heritage List in 2007. The German-born artist Hansen Bahia created a unique breadth of expressionist art. His works provide a good example of the influence by German immigrants on, and contribution to, the cultural richness of the South American country. Nearly four per cent of Brazil’s 190 million inhabitants are of German descent. Most of them live in the south of the country, where their influence on culture and society is most perceptible. However, German immigrants have also left their mark on the northeast of the country. An outstanding example is the German-born artist Karl-Heinz Hansen, known in Brazil as Hansen Bahia, who created numerous impressive works of art in Salvador. In future Hansen Bahia’s entire oeuvre will be on display here in Cachoeira-São Felix. Hansen Bahia’s works are strongly influenced by his chequered biography. Karl-Heinz Hansen, born in Hamburg in 1915, was a sailor, sculptor, painter and film-maker. However, he devoted most of his artistic career to woodcuts. He produced his first woodcut in 1946, shortly after the end of the Second World War. He took a simple piece of wood and, using the sharpened spokes of an umbrella, scratched into it motifs of Germany in the process of reconstruction. In 1949 he left Germany and, after a short stay in Sweden, emigrated to Brazil. He settled in São Paulo and worked for a big publishing company. During this period he created numerous woodcuts, which were displayed in larger exhibitions and at Biennales. His move to Salvador de Bahia in 1955 was a turning point in Hansen Bahia’s life. Even though he visited Germany from time to time, Salvador de Bahia became his second home. Here he created numerous works reflecting a symbiotic relationship between traditional German artistic craftsmanship and Brazil’s rich imaginative culture and exuberance. Hansen Bahia owes his name to the famous Brazilian poet Jorge Amado, who bestowed on him the epithet Bahia in honour of his work. Later Hansen Bahia donated his most important works to the town of Cachoeira. He also founded the Hansen Bahia Foundation, which has managed and taken care of his artistic legacy since his death in 1978. Part of the studio with a restored wooden printing plate on the wall. Over the years Brazil’s tropical climate has damaged the very delicate work of the woodcuts and threatened to destroy them completely. Hansen Bahia’s work was in grave danger of being lost forever. In response, the Federal Foreign Office provided funds under its Cultural Preservation Programme for the restoration of 78 woodcuts, which were then put on display to the public at the Goethe-Institut in Salvador. Although Hansen Bahia’s art is only one example of the diverse cultural exchange between Germany and Brazil, it is an impressive testament to the imprint left by German immigrants on the South-American country’s heritage. The Church of the Nativity in Bethlehem is a unique architectural ensemble comprising elements from 1700 years of varying cultural influences. The Church, which was declared a World Heritage site in 2002, is probably the oldest sacred building in continuous use in the Holy Land. Built in 339 AD under the auspices of Helena, the mother of Emperor Constantine, the original structure of the Church of the Nativity was largely destroyed, then rebuilt by Justinian in the mid-6th century and redecorated by the Crusaders in the 12th century. Today the Church is overseen jointly by the Greek Orthodox, Catholic and Armenian Churches, which means that the daily services and numerous religious festivals of all three have to be taken into account during the restoration work. Restoration began in 2013. 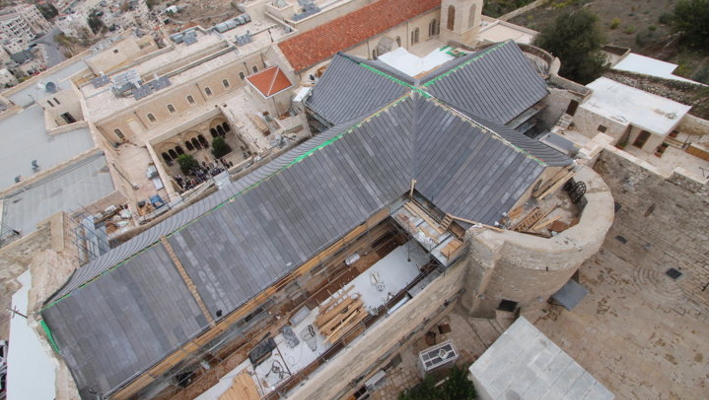 Supported by the international community and the Palestinian Authority, the Italian restoration experts of Piacenti s. p. a. first tackled necessary work on the roof and windows, then on the external walls, nave, plaster and mosaics. From a platform at the level of the joists, a temporary roof was installed to allow the restoration of the ancient roof system. Decayed sections of the joists were removed and replaced with ancient wood brought from Italy. The prime aim of these restorations was to retain as many of the original materials and elements as possible. The external walls and internal plasterwork had been badly affected by rain, humidity and some microbiological damage. Restorers specialising in the conservation of stone and plaster therefore first cleaned all the surfaces and removed extraneous materials, filling in cracks with a suitable mortar and consolidating the most badly damaged areas. At the same time, work on the nave began. View from the nave to the eastern door. A considerable amount of German support has been directed towards the restoration of the Church’s eastern door to the nave – a large ancient wooden structure with ornate woodcarvings which will soon again open to one of the most fascinating churches in history. Project: Christian Schaal, Giammarco Piacenti, German Representative Office Ramallah in cooperation with Piacenti s. p. a. From 1898 until 1914 the Chinese port city of Qingdao was a German concession. Even today the face of the city is dominated by old German architecture: Christ Church in particular bears witness to a bygone age. Christ Church, originally called “New Church”, was built by the Berlin Protestant Church Board between 1908 and 1910 and consecrated on 23 October 1910. Following the proclamation of the People’s Republic of China by Mao Tse-Tung, the then last service in Christ Church was held on 27 November 1949, the first Sunday of Advent. In the wake of the reform and opening-up of China, the exercise of religion under state control is again possible. Sunday services have been celebrated in Christ Church again since 1980. Today the church has around 1200 members and is used for baptisms, confirmations and weddings. It has a lively musical life ranging from the church choir to rap. Christ Church after a well-attended sunday service. The Free State of Bavaria, as part of its twinning link with Shandong Province, has done much to preserve the German cultural heritage in Qingdao. Now the Foundation for the Preservation of German-Style Buildings in China, with a grant from the Cultural Preservation Programme of the Federal Foreign Office, has worked with German experts to reconstruct the copper covering on the top of the spire. At the same time, the roof was restored with a weathercock to replace the one which fell in a storm in 1942. The next projects planned are the restoration of the pipe organ and the ornate leaded windows, which were destroyed during the Cultural Revolution. 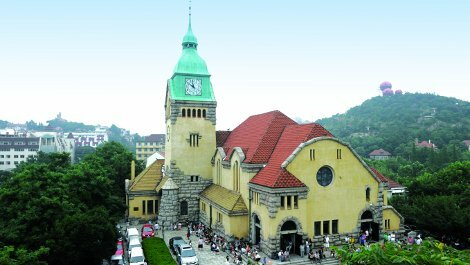 The restoration of Christ Church’s capped roof is no mere construction project; it is a highly symbolic project, a special way to approach Sino-German history. 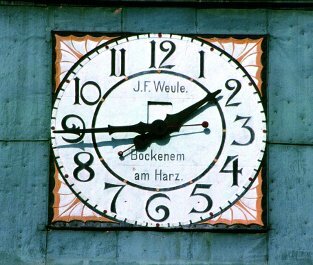 Clock of the Christ Church. Qingdao, whose economy and population are growing rapidly, is increasingly looking to its German colonial heritage, not so much out of nostalgia but rather in the realization that preserving and restoring its historic architecture will give it a competitive advantage over other cities which are becoming ever more faceless and similar as a result of modernization. Although other cities, e.g. 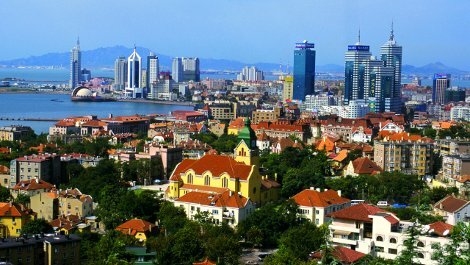 Weifang, Wohan and Tianjin, have notable German-style buildings too, only Qingdao has an Old Town laid out entirely in the European style. An application has been submitted for its inclusion in the UNESCO World Heritage List. The desert expanses of the Sudan still hide countless historical treasures which are only gradually coming to light. The city of Naga was an important place in ancient times, but was forgotten over the millennia. Only now are scientists finding out how much it has to tell us. In 1995 a team of researchers from the Egyptian Museum Berlin began to excavate the site of the city of Naga in the steppes northeast of Khartoum. The city had lain untouched for two thousand years. Numerous huge heaps of rubble marked the area. Four wellpreserved temples decorated with reliefs and inscriptions showed that, from 300 BC to 200 AD, Naga was a royal city of the Meroitic Kingdom, the powerful southern neighbour of Ptolemaic and Roman Egypt. Restauration work at the chapel of Hathor. Over ten years of excavations, the Amun Temple was uncovered on its dominant position on a hill above the city. An avenue of twelve monumental ram statues lining the approach to the temple and the columns of the hypostyle discovered under rubble and winddriven sands were restored. Many of the findings in the temple – statues, steles, altars painted and decorated with reliefs, wall paintings – present an extraordinary wealth of new material for research. A hill south of Amun Temple proved to be a veritable treasuretrove. More than 1500 relief blocks found there could be pieced together to recreate the pictures on the collapsed temple walls. Since October 2009 three wall panels with life-size depictions of Meroitic gods have been on permanent loan from the Republic of the Sudan to the New Museum in Berlin – a remarkable token of cultural cooperation. The Naga project will end for the time being with the restoration of the Chapel of Hathor with funding from the Federal Foreign Office’s Cultural Preservation Programme. The combination of Pharaonic, Graeco-Roman and Meroitic forms is a reflection of the Meroitic Kingdom’s function as a bridge between Africa and the Mediterranean. State-of-the-art technology was used in the restoration. 3D strip light scanners produced a survey of the architecture accurate to the millimetre. 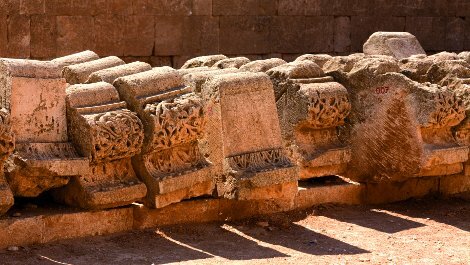 On the basis of these findings, the badly damaged capitals were copied in synthetic stone. The originals are to be exhibited along with other artefacts in a local museum devoted to the excavations; the museum has been designed free of charge by the British architect David Chipperfield. In this way Naga can again become a focal point of the Sudan’s historical and cultural identity.